While many Americans hate either Republicans or Democrats with a gripping passion, many others see the differences between the two parties as relatively minor. Some even see the two parties' fierce disagreements on emotional issues � such as gay marriage, abortion, and gun control � as fluid and convenient, designed to distract voters from the two parties' larger agreements on the billion-dollar issues � wars, global finance, environmental destruction, and corporate commerce that exploits poor and middle class people in the United States and abroad. When one considers these apparent larger agreements and then also considers the way the American corporate media emphasizes the two parties' differences essentially without commenting on their similarities, a strange thing happens. The edifice of everyday politics turns into a diaphanous veil before one's eyes, and it becomes possible through the cloth to catch glimpses of the truth about current events. One may realize, for instance, that in other democratic countries a minority party might voice opposition to something like the invasion of Iraq by walking out of Congress. Democrats stayed seated throughout the buildup, the lies, and the invasion. They stood up on several occasions during Bush's recent war-focused State of the Union address � to applaud. And then one might look at the media. Instead of questioning the tepid resistance to war in Congress when a growing majority of the population now wants it to end, the corporate media continues to tell us all about the differences between the parties. We are expected to pick a side and join the fight. We are told, always, ad nauseam about our 'deeply divided nation.' We hear that one party advocates for business, the other for poor people; one for lower taxes, the other for more government programs. But even these tired, questionable comparisons are undertaken within a narrow purview. The New York Times, the trendsetter of the corporate media, which is seen generally as a liberal publication and duly attacked by Republicans while defended by Democrats, essentially never runs pieces that penetrate this veil of discourse. For example, in its countless pages it doesn't explore the obvious radicalism of the current administration in relation to past administrations: the secrecy and use of huge lies; the hostility to the Constitution and use of secret trials; the creation of corrupt committees to enforce or oversee corporate regulations. Neither the rest of the Republicans, the Democrats, nor the media talks about this new radicalism on the part of the current administration, perhaps because to do so would entail revealing how close the rest of the Republicans and the Democrats themselves are to the same politics. Thus the veil obscures an entire massive shift in U.S. politics. From another angle, if one believes the purpose of news media in a democratic society is to challenge authority, to speak truth, and to expose lies, so that citizens can make informed decisions regarding their government, virtually the entire corporate media fails everyday to qualify as news. To obscure this failure, to avoid telling the facts of the day with the proper emphasis, the corporate media outlets often claim they can't make judgments between two competing claims, and thus can't take much time to focus on a given, real emerging news story. At other times, as former Ambassador Joe Wilson observed, the corporate media seems to think that when presenting a fact, "you need to balance it with a lie from the White House." These, one can observe, are the ways lies are told and the truth is obscured by the veil. It all begs comparison to the propaganda machines from the days of Goebbels and the former Soviet Union. But let's not get ahead of ourselves. If one doubts the existence of this veil, observe the way it hides outright contradictions. Consider the behavior of the two parties in these Bush-Clinton years. The federal budget surplus has now been destroyed and huge debts have been racked up by the Republicans � but the media doesn't highlight this, since the Republicans are the party trusted with fiscal discipline. Ostensibly it goes without saying that it would be much worse under the other option, the Democrats. Likewise, in the 1990s, when the welfare system was dismantled and millions were silently kicked off the support rolls by the Democrats under Clinton, the media didn't cover this too much, either, since the Democrats are the party trusted to be generous with social services. And today the Republicans converted the misunderstood events of 9-11 into aggressive invasions of sovereign nations (Iraq, Afghanistan, and Haiti in the past three years) � but it was a conceivable reaction, since the Republicans are the party trusted to be patriotic and wield the military fiercely but justly. The veil props up certain parties as trustworthy on certain issues. Raid environmental regulations when Democrats are in control, and no one will ask questions. Observe how dismantling the nation's Social Security program (the government's most popular program) is hitting snags today. The Republicans simply are not the party trusted with reforming social programs, so the veil will not hide their actions. So what's going on behind this veil? Are the two parties in some secret agreement? Are they dancing a choreographed routine that both enjoy and neither could dance without the other? On the extraordinarily rare occasions when the two parties' similarities are mentioned in the media, we are told first that the vast majority of America agrees on the biggest issues. Then it's explained to us that the two parties have 'gone centrist' in democratic fashion, as a response to the will of the electorate. Thus the similarity of our parties is an indication of how perfectly our democracy works! The majority of Americans no longer affiliate with either party. Indeed, a near majority no longer votes at all. When people are polled as to why, they don't say, "I like what both parties stand for." No. They say things like, "Neither guy speaks for me." "It won't make a difference." "They're both liars." Polls do not find widespread apathy, but rather widespread sentiment that the politics of the two parties do not engage common people's needs or interests. Furthermore, when people are polled on specific issues, instead of on candidates, the whole range of issues upon which the parties agree come up. Majorities regularly oppose the two parties and favor universal healthcare, strict environmental regulations, and, now that the propaganda is wearing thin, an end to the Iraq War. A recent poll also found a two-thirds majority in favor of a new, nonpartisan investigation into who did � and who knew in advance about � the events of 9-11. The truth is that people are choosing to skip elections, to call themselves independents, or to join alternative parties - the Green Party, for instance, is somehow growing rapidly in a system designed to prevent the growth of new parties. But the veil conceals all this. We hear that an election is won 50%-46%, not 29%-24%, a figure that would more accurately reflect the sentiments of all eligible, registered voters. Instead, the veil depicts a 'deeply divided America' with 'deeply divided political parties.' Beneath this sham, the reality may be that the parties' verbal tussles are more like staged fistfights. The most straightforward explanation for this layer of lies through which Americans are increasingly forced to view current events is that the three main poles of power that exist in the United States � the two parties and the media � are controlled today by a single group of financially interested players: large corporations. A courageous reporter named Laurie Garrett recently resigned from Newsday, which is owned by the Tribune Corporation. In resigning, she said, "The leaders of Times Mirror and Tribune have proven to be mirrors of a general trend in the media world: They serve their stockholders first, Wall Street second, and somewhere far down the list comes service to newspaper readers." Garrett, a Pulitzer Prize winner, made it clear that she was also including the New York Times and the rest of the corporate media in her lacerating criticism: "This is not a uniquely Tribune or even newspaper industry problem. This is true from the Atlanta mixing rooms of CNN to Sulzberger's offices in Times Square. Profits: that's what it's all about now." Profits. People need clean air, water, and food to survive. Corporations need profits. It's the nature of the beast. Large corporations need large profits. And the large corporations of three decades ago are now massive supranational corporate empires. These giant entities have very different goals and interests from common American citizens on a whole range of issues � on healthcare, on the environment, on taxation, on war, on unemployment, on tort litigation and lawsuits, on drugs, on criminal justice, and on local, national, and global commerce. At least one supranational corporation opposes virtually every change or piece of legislation that common American human beings desire. Huge profits are at stake. But were corporations and their rich executives and owners, upon finding themselves (in their professional capacity) opposed to a popular initiative or proposed government program, to simply come out and wield their power overtly, they would risk very bad public relations. And bad public relations would reduce rather than increase profits. Instead, in such a situation, a better option would be to learn to utilize their power slowly, without alerting too many people to what they really want or to what they're doing. This would rarely involve a conspiracy or master plan, but would entail instead at key junctures merely "doing what's good for business" and "taking prudent steps." Via strategic financial support and occasional outright purchases, corporations would slowly, step by step, issue by issue, year by year, begin to take control of the media and the political parties. Of course, while doing so, they would avoid telling the whole truth in their own media outlets about what they're doing. And soon their media outlets would include all of our media outlets too. Over decades, a layer of half-truths would thus emerge between their actions and public awareness. Certain perspectives on, say, healthcare, or global trade, would be offered more frequently than other perspectives � both by the media pundits and reporters, as well as by the politicians and officials, all of whom would be receiving money, exposure, and support. There would be content and then there would be advertisements, but increasingly the two would be saying the same thing. Certain language, certain words, and certain phrases would begin to be ridiculed and fall into disrepute. Others would become fashionable. Controversies and scandals would be covered from limited perspectives. Finally, whole topics would be avoided, while others would be debated with glamour and with fierce, attractive emotional intensity. Rarely, but occasionally, there would be necessary small crimes and conspiracies. Branches of government, the CIA, organized crime, and corporate competitors would be involved in various capacities. But generally this mist of confusion, this veil, this layer of gauze between the people's awareness and reality would be constructed legally. To me this seems to be the best explanation for what has happened. I believe that the phenomenal success of The Matrix, the Warner Brothers/Wachowski Brothers film starring Keanu Reeves, occurred because it struck a nerve deep in American national consciousness. Sure, to attract viewers the film had its allotted love story and its extravagant Hollywood action scenes, as well as the relatively untalented presence of Reeves himself. But what was special about the film was the story it told. Like a fable told by a storyteller in centuries past that relates in a clever if not veiled way the truth about current society's morals, mores, and lifestyle, The Matrix spoke to Americans as few movies do. Some people consciously � and many more subconsciously � recognized on a visceral level during the movie something familiar about that world, that matrix. Yes, here, today in the United States of America. There exists a lens of lies, a layer of half-truths separating us from reality. It's the media and the politicians, the news and the commercials. More than just a veil that hides certain facts and perspectives, it's a matrix that subtly guides our thoughts about what exists on both sides of the veil. Ask yourself, how do you first find out about an event that occurs outside of your home? Who knows. Perhaps a lot. Without the matrix, our lives might be quite different. We might hunger for different foods, different relationships, different communities, different life goals. We certainly might perceive our economic and political situations very differently. As it is, we have neither true conservatism nor true liberalism in our political dialogue. We have neither real progressives nor real Christians represented in our popular culture. What we have instead is a single party. We have a single ideology. We have but a single lifestyle, an orthodoxy, that uses words like 'productive,' 'efficiency,' and 'consumers.' This language, of course, is the language that maximizes corporate profits. Our politics, our culture, our social lives, perhaps our very minds, have all slowly, subtly been shaped and molded into the form most profitable for corporations. Yet it's difficult to know within the matrix how different our lives would be without it. Perhaps we wouldn't be so different after all. Let's take a closer look where we can. This article focuses on politics, and of all the effects of this matrix, I think that what can most accurately be measured is our awareness of the issues that directly affect us. By studying the coverage of essential issues in the media, and the quality of the discussion of them by government officials, we can begin to quantify the 'thickness' of the matrix. You readers of G&G already probably read much beyond the corporate media know we're missing quite a bit out there. Have you noticed that poverty - the 'lifestyle' of 50-80% of the planet - is never represented in our corporate media? When was the last time you saw on TV or on the front page a story, not tied to some natural disaster or war, on poverty? Now consider how much you think you know of the real story about: The Iraq War; The militarization of space; The actual events of 9-11; The destruction of the environment; The largest transfer of wealth from the poor to the rich in American history; Electoral fraud; The drug war; General geopolitical events. Extremely few of us know much of the real truth about these issues. And that's the introduction. This issue of G&G seeks to investigate, examine, and illuminate this layer of lies through which Americans view current events. Where is it 'thickest?' Where is it absent? 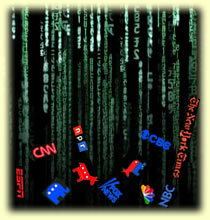 To begin, we offer a review of recent news articles that have quietly poked through the matrix. A Texas Republican Asks, What If It Was All a Big Mistake? A Top Former CIA Agent Outs "Attack Matrix"
Going more deeply, this issue of G&G also offers opinion perspectives in order to explore directly the possible existence of a matrix in a variety of places in our popular awareness. Entering the Era of Deep Politics - Does the matrix veil the truth about our government's objectives? Liberating the Mind, Leaving the Matrix - How do our minds accept or reject participation in a matrix? The Matrix in the Military: An Interview with Stan Goff - Does the matrix veil the truth about our military's objectives? I Want the Earth, Plus 5% - Does the matrix veil the truth about money, banking, and global finance? Book Review: Confessions of An Economic Hit Man - How are the realities of global commerce - and 9-11 - related to us through the matrix? Finally, if there is a matrix, and if 98% of what we hear and see really comes filtered through it, whom do we turn to? This becomes a huge question. Many, many of us remain conditioned to believe things only when we read them or see them in a corporate media environment. I myself didn't come to question the government story about 9-11 until I saw contradictions and smoking guns right there in articles in the corporate media. But paradoxically we thus assure ourselves of viewing reality through the one lens known to have a bias. The corporate media bias, as Laurie Garrett put it, is simply to increase corporate profits. Plain and simple. Well, perhaps plain but not simple. When all else is equal, this bias means purely making profits by selling newspapers, TV programs, and the advertisements in them. Coverage suffers if the news isn't entertaining. But of course usually all is not equal: usually there's a lucrative piece of legislation, a profitable product, a lifestyle perspective, or a war to advocate for. Coverage then suffers mightily as it's tailored to propagandize. General Electric (GE), a supranational corporation that makes weapons and engines for fighter jets, owns NBC and countless other media outlets. GE's stockholders eternally want maximum return on their investment. Indeed, the executives of GE are under direct orders to do whatever is required to maximize stockholder return (they are legally required in some instances to do whatever will maximize stockholder return). Wars hugely increase GE's profits. So GE and NBC must take the most profitable action: they will advocate for war, while trying to appear neutral whenever possible, so as to retain the maximum viable quantity of credibility (a valuable commodity). Unfortunately, there's no easy answer. I wish I had the book, the radio station, the website that contained the unvarnished truth, updated daily. I wish I had the magic question or shibboleth to use to tell the few real brave reporters from the countless career-oriented corporate shills. All I have is the knowledge that the corporate media � everyone from the vaunted New York Times, with its fantastic resources and worldwide reach, to your lowest small town daily that recently got bought by News Corp. or Disney, to the radio stations and TV stations you can't refrain from watching � they are lying to us. All of them. About everything. About the war and about your neighbors. They lie least in stories closest to home, so trust the New York Times more about Brooklyn than about Buffalo, more about Buffalo than about Boise, and more about Boise than about Baghdad. No, there's no easy answer. But there is a short answer. The American matrix is hardly original. It's simply a modern, highly effective propaganda machine, organized in a decentralized way through the conscious and unconscious efforts of the dominant organizations of our time � large corporations. The corporate media (with a few exceptions) and our politicians (with a few exceptions) fit themselves into this matrix to survive and prosper. The single most important thing to realize about the matrix is that it exists. This is what the people of China and the Soviet Union had over us � they knew their news organs were mostly propaganda. They knew to read and listen critically. If every American watched CNN as if he were watching a Chinese news network, we would be far better off. As it is, we Americans are carefully taught to deny (or even laugh about) the existence of propaganda in America. We are taught to fit our objections into the matrix: "FOX is propaganda, but NPR is pretty good." "The whole media is liberal and full of lies, but people like Rush Limbaugh help us see through it." Realize that even the textbooks most American children use are made by one of three giant corporations. These corporations have countless other entangling, profitable holdings. The matrix they have helped create has inherited from Hegel and the Prussian origins of public education a crucial notion: by defining what constitutes the right and left � by teaching and constructing what exactly is conservative and what is liberal, what is Christian and what is progressive � one can ensure that any society's mainstream thought will never lurch outside of that defined dialectic. None of us is immune, of course. Some of us do better than others at sneaking peaks outside the matrix. But it's hard! We've been taught not to look, not to learn the real nature of power as it functions in the United States. Internet media is increasing in quality, but it can be a jungle out here in cyberspace. Realizing the matrix exists is enough to begin the process of waking up. Imagine every day seeing beyond the veil and perceiving reality a little more directly, and you will begin to wake up. You will begin to ask yourself two questions: What am I hearing? Who is saying it? I know you're out there. I can feel you now. I know that you're afraid... afraid of us. You're afraid of change. I don't know the future. I didn't come here to tell you how this is going to end. I came here to tell how it's going to begin. I'm going to hang up this phone, and then show these people what you don't want them to see. I'm going to show them a world without you. A world without rules or controls, borders or boundaries. A world where anything is possible. Where we go from there is a choice I leave to you. Let us each wake up in our own way, at our own time. It may be scary or painful, as Neo's experience is early in the film. A child, too, who learns one December 25 that Santa Claus doesn't exist experiences the pain of waking up. Who really wants to know the truth about our wars, about impoverishing the planet, about 9-11? But ultimately the act of waking up � from sleep, from childish beliefs, from delusions, from addictions � is intrinsic to the act of growing and identical to the act of learning. Awakening is an essential aspect of being alive. We have a deeper truth, a more universal perspective, and a freer mind to gain. We have only our delusions to lose. Tony Brasunas (tony@garlicandgrass.org) is publisher of Garlic & Grass. Another example of the effectiveness of the matrix is Ralph Nader's campaign in the 2000 election. Following the election, we were told endlessly that Nader had helped defeat Gore and elect Bush, and since it seemed possibly true, and since Democrats and progressives wanted so badly to blame someone who would listen, the entire story was successfully lodged by the matrix into the collective consciousness of America. Of course, Nader had not helped Bush win. Rather, Nader had helped Gore win. See Ralph Nader's Campaign and the Fateful Election of 2000 and the articles listed beneath it. Economic figures about the bipartisan, largest-ever-in-American-history transfer of wealth from the poor to the rich, come from United for a Fair Economy, among other sources. The meritless second and third installments of The Matrix were odd, Star Trek-like films that seemed really to be The Matrix run through the matrix. Lance Klumpe of new south wales, australia writes: i want to see how deep the rabbit hole goes. i know neo. Brian Emerick of Ocala, FL writes: What a really great site. Thanks for your efforts. Until we deal with the core of our problems they will never be fixed. Those problems are our representatives and how they are elected. We have to get the big corporations and big money out of the political system. I hate to sound like Ross Perot, but maybe the septic needs more than just a pumping. Maybe it's time for a new one. The Declaration of Independence gives us the right to change our government; in fact it almost directs us to do so. Well folks, I think that time is here. Let us draw up the indictments, and get on with forming a new government. PS: Read the first part of the DOI each week, it so inspires. Type the word shown in the box.